Easily readable digital display shows the exact angle at once. With its horizontal and vertical bubble level, it can be used as a spirit level. 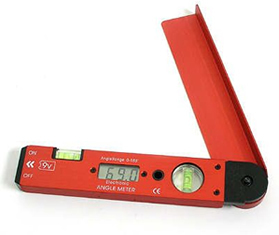 Angles can be determined with accuracy of +/- 0.5 degree The measuring scale extends from 0-185 degree, i.e. over the whole scale you have a 0.1 degree reading.